Celestials are small when compared to other goldfish varieties. They have a torpedo-shaped body with a curved back, which lacks a dorsal fin. They generally grow to a length of about 5-6 inches. Colour - orange, black, and calico. These wild carp originated in Asia; Central Asia (siberia). They inhabit the slow moving and stagnant waters of rivers, lakes, ponds, and ditches feeding on plants, detritus, small crustaceans, and insects. Goldfish were originally developed in China, but by the 1500's goldfish were traded to Japan, to Europe in the 1600's, and to America by the 1800's. The majority of the fancy goldfish were being developed by Oriental breeders. The results of this centuries long endeavor is the wonderful goldfish colors and forms we see today. Today domesticated goldfish are distributed world-wide. The Celestial Eye Goldfish are believed to have developed it in the later part of the nineteenth century, somewhere around 1870. During this time its eyes were at least partially mobile, until the early 1900's when the Japanese further developed it. Then through selective breeding it was developed it into a goldfish whose eyes were permanently locked in an upward position. This is one of more than 125 captive bred fancy goldfish varieties. Their English name is ‘Celestial Goldfish’ (meaning an astral goldfish). Telescope-type goldfish such as the Telescope, the Bubble Eye and the Celestial are said to have very low eyesight. Variants of the celestial goldfish include the Deme-ranchu and the Toadhead or Hama-tou. 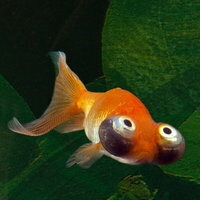 Celestial eye goldfish are characterised by two anatomical abnormalities that cause significant disability to the fish. The first is that the abnormal orientation/position of their eyes, which are rotated through 90 degrees, so that their vision is directed upwards. Associated with this malposition of the eyes is degeneration of the retina – the layer of the eyes that is sensitive to light and converts it into neurological activity (Matsumura et al 1981, 1982, Sakaue et al 1987). The second feature is lack of a dorsal fin (a fin on the middle of the back). It is the first abnormality that is the primary cause of our concern for welfare in this fish. Their most distinctive feature are the eyes which extend out from the sides of the head and are locked into a permanent upward looking position. In juveniles the eyes are normal, but within a short time the eyes begin to protrude. Then the upturned vision develops and they become locked in. They are available in color varieties of orange, black, and calico.The average goldfish life span is 10 – 15 years, though living 20 years or more is not uncommon in well maintained goldfish aquariums and ponds. The Celestial Eye Goldfish will generally eat all kinds of fresh, frozen, and flake foods. To keep a good balance give them a high quality flake food everyday. Feed brine shrimp (either live or frozen), blood worms, Daphnia, or tubifex worms as a treat. It is usually better to feed freeze-dried foods as opposed to live foods to avoid parasites and bacterial infections that could be present in live foods. Due to their upturned eyes they have poor vision and a harder time seeing their food, so need extra time to feed.